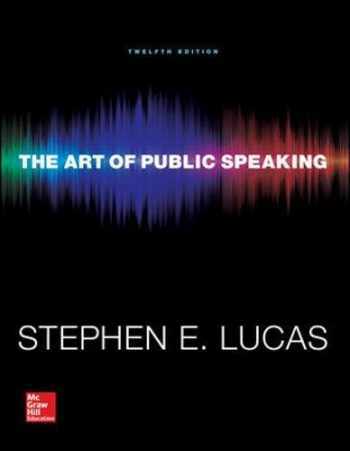 Acknowledged author Stephen Lucas wrote The Art of Public Speaking comprising 388 pages back in 2014. Textbook and etextbook are published under ISBN 0073523917 and 9780073523910. Since then The Art of Public Speaking textbook received total rating of 4 stars and was available to sell back to BooksRun online for the top buyback price of $2.37 or rent at the marketplace. NOTE: This is a Standalone book and does not include Access card/ Code.The Art of Public Speaking personalizes learning for every student no matter who they are or where they are, ensuring that they come to your public speaking class confident, prepared with the principle foundations, and ready to participate in your teaching and coaching.